The JAMB CBT Software is loaded with Jamb Questions and their solutions, diagrams and explanations. Get the JAMB CBT Software with activation code that contains all subjects, works without internet, and even prepares you for Post-UTME. It's Free to Download Here. - Activate Once, Use it for Life of your computer system. - Have access to over 40,000 CBT past questions (1978 - 2016). - 2016 CBT Questions, now included. - Supports Agents, Resellers & Bulk Purchase. - Supports Multiple users on a computer. - Myschool CBT Ranking, now included. - Myschool CBT Competition Ready. - Ability to update new questions. - Ability to get corrected questions & explanations. - Carry all subject's questions, answers and explanations in your computer (1978 - 2016). - Can search for any question & answer. - Can study without internet. - Access the full JAMB Brochure for free and fast too. - Access the latest JAMB Syllabus for free and fast too. 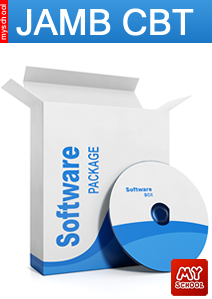 - Can install on your family or public computer system.